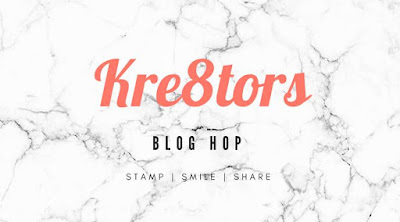 Welcome to the 2019 Kre8tors February Valentine Love Blog Hop. I hope the ideas that we share on this blog hop will help inspire you to create your own projects for the people that you love. Whether you are looking for ideas for Valentine's Day, a wedding, anniversary or just a way to show someone how much you mean to them, this blog hop will provide you with a wealth of inspiration to get you started. 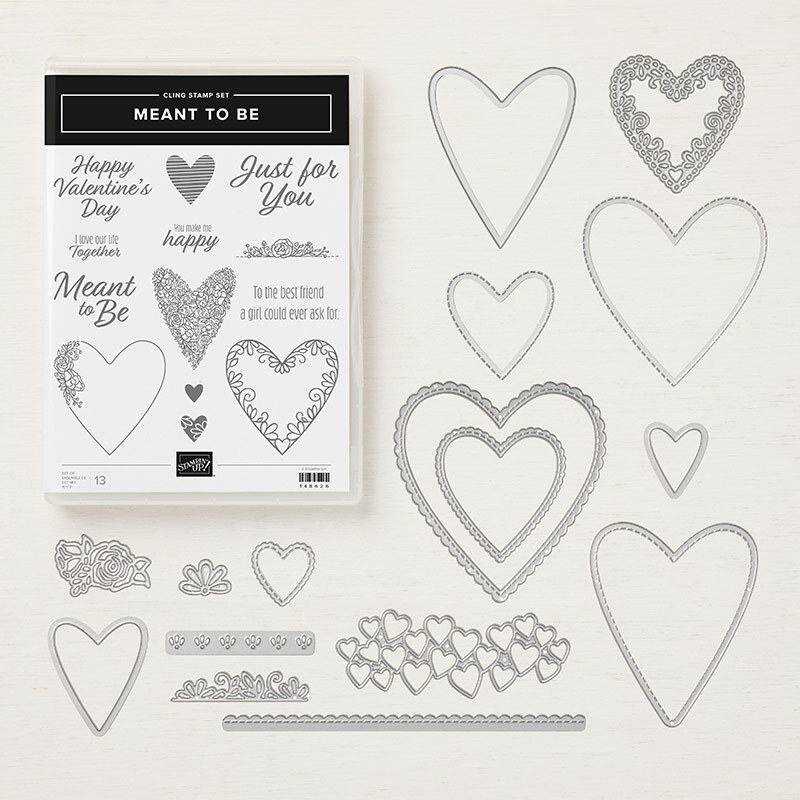 My Valentine card design features the Meant To Be Bundle (item #150587) and the coordinating All My Love Designer Series Paper (item #148576) from the 2019 Occasions Catalog. These products work beautifully together to create simply elegant, romantic card designs. I chose Soft Sea Foam cardstock for the card base and added a layer of the designer series paper to create a soft and pretty background. I die cut a piece of Lovely Lipstick cardstock with the largest heart die from the Be Mine Stitched Framelits dies (item #148527) to create a scalloped heart frame and large heart die cuts. I embossed the large heart with the Tufted Dynamic Embossing Folder (item #146335) to create a quilted look. 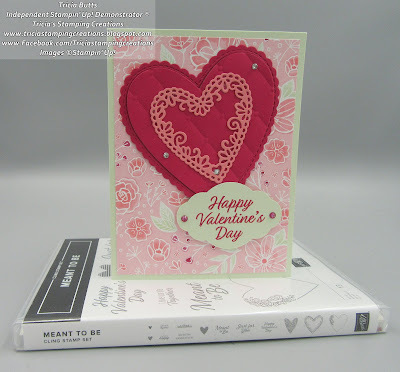 I attached the scalloped frame heart to the card base using Snail Adhesive and added the embossed heart to the center of the frame with Stampin' Dimensionals. 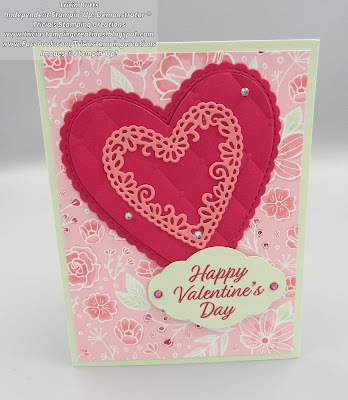 The detailed heart die cut has been die cut using one of the dies from the Be Mine Stitched Framelits Dies from a piece of Flirty Flamingo cardstock. I attached it to the center of the embossed heart using Snail Adhesive. I added small Basic Rhinestones to the heart design for a touch of bling. The sentiment is from the Meant To Be stamp set (item #148626) and I heat embossed it onto a piece of Soft Sea Foam cardstock with Lovely Lipstick Embossing Powder. I punched out the sentiment using the Pretty Label Punch (item #143715) and attached it to the card front with Stampin' Dimensionals. I added two Basic Rhinestones that I colored using the Dark Lovely Lipstick Stampin' Blends Marker (item #147028) to the sentiment to add the finishing touch. This soft and pretty card design can be created for a variety of occasions for someone you love, just by changing the sentiment. It would be wonderful as a birthday, anniversary or even a wedding card. 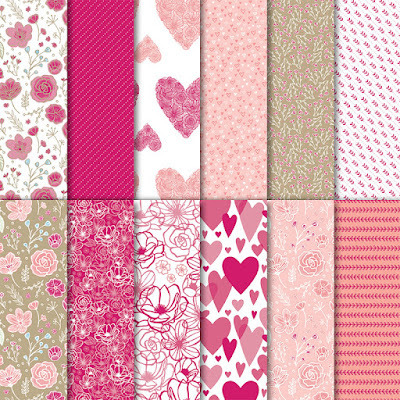 When you order the stamp set and coordinating framelits as a bundle, you can save 10%. During Sale-a-bration, you can earn Free exclusive products with a qualifying order. If you live in the U.S. and don't have a demonstrator, please contact me and I would be happy to help you. Thank you for taking the time to visit my blog today. I hope that you have enjoyed my card design and it inspires you to create something special for someone you love. Now it's time to visit Kathy's blog and see what she has to share with us this month. I hope that you will enjoy the ideas we have to share today on our blog hop. Tricia, your card is beautiful! 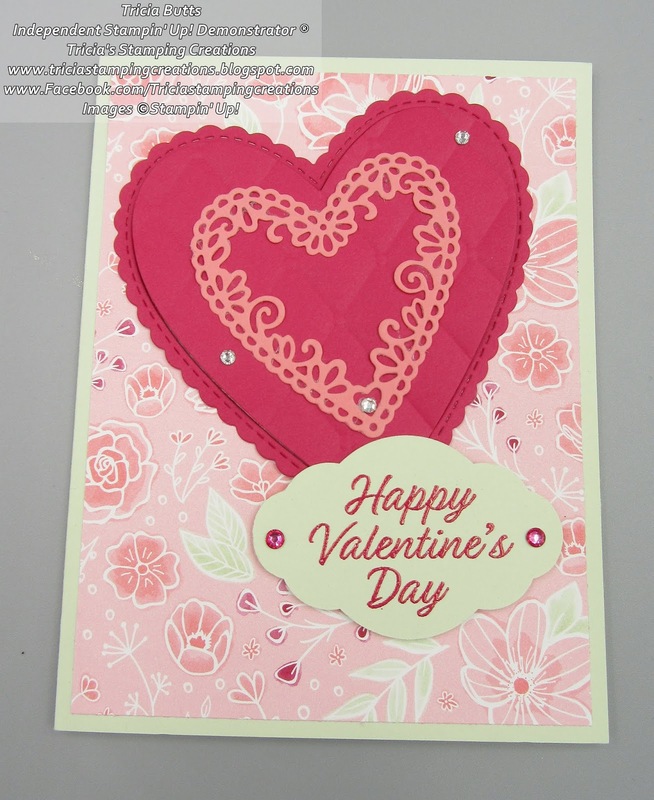 I totally love that Tufted embossing folder and how you've used it on the heart! Your color scheme is gorgeous, too! Thanks so much for hopping with us and sharing your fantastic project! This bundle is so super cute - and your card ist beautiful! Lovely card, Tricia! The Tufted Embossing Folder is one of my favorites. It looks amazing embossed on the heart! Beautiful card!! That card is so pretty with the detailed heart framelit inside! Somehow this die set passed me. I have to say I regret not getting it sooner. Your card is beautiful. I love the embossed effect on your heart, great idea. Your card is lovely Tricia! I have had a lot of fun with this bundle too. 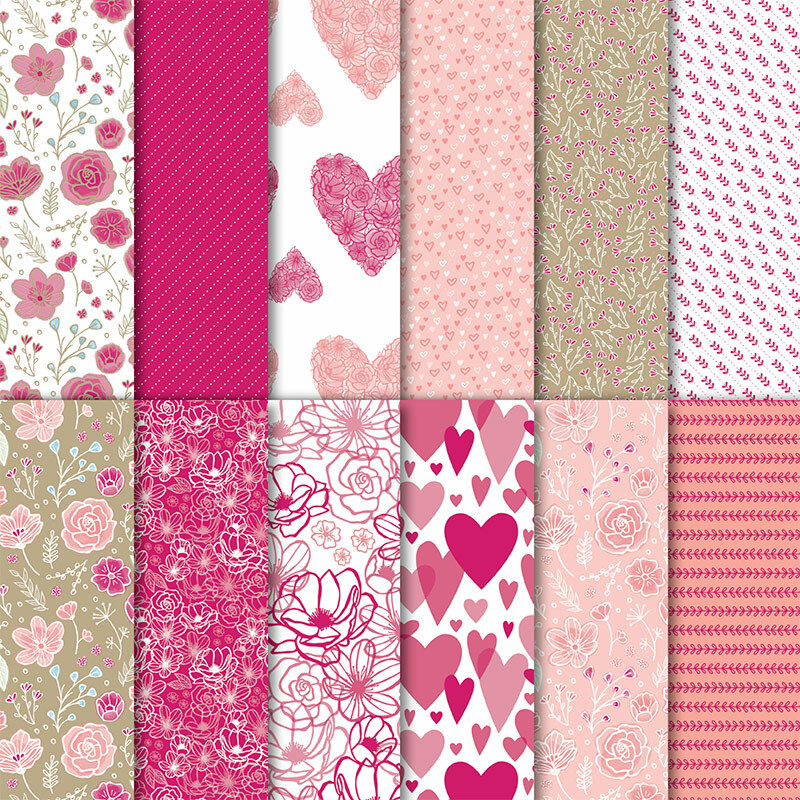 Tricia, Such a nice combo of texture, pattern, red and pink for your Valentine! Beautiful Card ! :-) This thinlit dies will never leave my craft room, even after discontinued. I love Soft Seafoam and you have done such a nice job at highlighting it in your design! Wow, I love the layered heart and all the details in it! Pretty card, love that DSP!